Deqa Dhalac on a recent shopping trip at the Hannaford grocery store near the Maine Mall..
Caroline Losneck reports on how one Maine Muslim family celebrates Ramadan. PORTLAND, Maine - Ramadan is the holy month observed by Muslims around the world. And in countries where Muslims are a majority, work days are shortened during the month to accommodate the time spent praying and sharing festive meals to mark the end the daily dawn-to-dusk fast. During this period of spiritual reflection, which ends this weekend, different families observe Ramadan in different ways. I'm with Deqa Dhalac at the Hannaford grocery store near the Maine Mall. She's walking up and down the aisles, filling a shopping cart with a few items to round out her evening meal. Dhalac is a Human Services Counselor for Refugee Services for the city of Portland and she's just finished her work day. But her next meal won't be for another four hours, after sunset. "So I'm buying a lime," she says, "because there is a certain dessert, sweets that we use for that, particularly for Ramadan. It's papaya with banana and sugar and lime. So, I run out of limes, so I need those. So, it's a good price - three for $1 - you can't beat that." Dhalac says she buys lots of dates and meat for traditional Somali food at halal markets. But she also buys pizza dough and some items you might not expect during the observance of Ramadan. 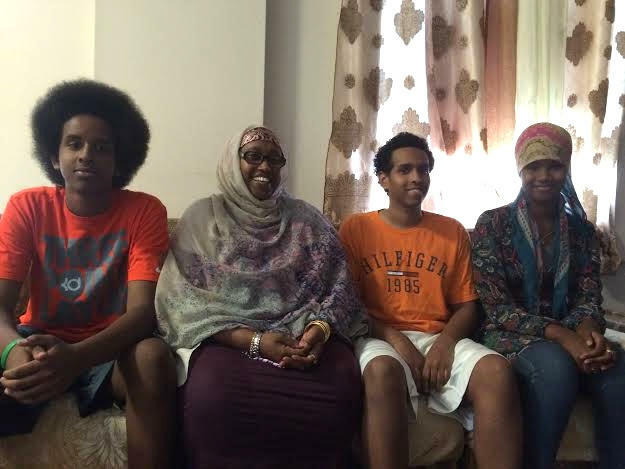 Deqa Dhalac, second from left, with her three children, left to right, Mahad Farah, 15, Saeed Farah, 22, and Saharla Farah, 14, in their South Portland home during Ramadan. Fasting during Ramadan is one of the five pillars of Islam, along with the Muslim declaration of faith, daily prayer, charity and performing the Hajj pilgrimage to Mecca. Followers of Islam don't fast the entire day. There is a super-early pre-dawn meal called a "suhoor" and a break of the fast after sunset each day with a meal known as "iftar." Iftar is often shared with family and friends. About 10,000 adults- fewer than 1 percent of the people in Maine - are Muslim, according to a 2014 survey by the Pew Research Center for Religion and Public Life. Many people regularly attend a mosque, but the Dhalac family does not. They observe Ramadan at home. "So full of chicken sandwiches for the kids in case they want that, this is the sambusa, already ready and frozen," Dhalac says. "All I have to do is put it out the day we're going to be eating." Back home, Dhalac unpacks her grocery items and is greeted by her three kids. Mahad Farah is the middle son. He's 15 years old and out of school for the summer. He stays active during Ramadan. "For me, like, I don't want to just sit home and just do nothing the whole day," he says. "Like, I just want to kill time by going outside the house, maybe playing basketball with my friends. So, that's how I see it." He’s also getting ready for a trip. "I'm going to visit my dad in Atlanta, so I'm going to be traveling. I won't be fasting tomorrow, so I'm going to have to make up the day." He says can make up the days when he's not fasting after Ramadan. But the holy month is more than just fasting, says his mom, Deca Dhalac. "It's a lot of things, it's not only one thing. And people just have that stuck in their head. It's to do charity, it’s to be humble, to be thankful. You know, all of the goodness of the month. And prayer and prayer and prayer." "I think it's more of, like, a connection thing," says 14-year-old Saharla Farah, the youngest member of the family. "It's, like, a disconnection from food and drink building a better connection between you and your God, kind of. Saharla Farah's older brother, Saeed Farah, 22, is a University of Southern Maine theater major. He recalls a time a few years ago when he volunteered at the Preble Street Resource Center during his Ramadan fast. "I just kept it to myself, you know," he says. "But it was good for the other people to get their food, you know, being taken care of." The traditions that Deqa Dhalac and her kids - who were born in the United States - follow now are similar to, and yet still a bit different from, the ones she followed growing up in Somalia. "In Somalia, people are all up all night, you know, talking and eating and chitchatting, you know. There are gatherings, family gatherings, neighbors, and gift bags. And here, you don't have that luxury. You have to work. You have to get up early in the morning, so you can't hang out all night." There are other differences, too. "Well, yeah, such as the prayer - you know, the calling for the prayer," Dhalac says. "Here, you don't hear that, so we have it in our smart phones." That’s the app Dhalac has on her cell phone that calls her family to prayer five times a day during Ramadan. It also plays the Qur'an. She says it’s common now, but that she couldn't have imagined using her smartphone for Ramadan when she was a kid. But this brings the observance and prayer practice in sync with her family’s modern technology habits, says Saharla Farah. "A lot of people think that if you’re part of this religion you have to do this. It’s a choice and you gain a lot of knowledge out of that choice." The end of Ramadan is marked by Eid ul Fitr, a large three-day celebration that starts as soon as the new moon is visible. As part of Eid, Muslims celebrate by putting on their best clothing, attending large gatherings, giving gifts, spending time with their families, and having a large meal during the day. Whenever Eid falls, Dhalac’s family is ready. Editor's note: This year, Ahmed Abdiahman, religious and social coordinator at the Maine Muslim Community Center in Portland, says that the Eid celebration will be at 9 a.m. at the Portland Expo if it is on Friday, and at the Fitzpatrick Stadium in Portland if it falls on Saturday.